Hurricanes and rains in the northern region of India have been destroyed again. 16 people were killed and 16 were injured in separate areas from Saturday to Sunday. On Saturday, six people were killed in lightning in Shahjahanpur. So 14 people trapped in Betwand river floods in Lalitpur and Jhansi districts were saved by airflights. According to the government, 16 districts were most impressed. 461 homes were damaged due to heavy rains. In the mishap, 18 cattle were also killed. Chief Minister Yogi Adityanath has instructed the District President and MLAs to visit the affected areas and pay attention to relief operations. Due to the flooding, many areas have lost life. 16 people were killed in the state due to heavy rains and lightning struck. Ashok, who was working in the farm at Sikandarpur Khurd village, died of lightning while he was seven years old in the old village due to heavy rains. Five of the injured people are undergoing treatment in the hospital. Seven died in the same area. In Shamsharpur village of Sham Sadar taluka, seven children were feeding on the farm on Saturday evening. Rainy children sit down under the trees. There were five children who died in lightning, and two children died. Similarly, in nearby Nabipura village, some people were working in the fields when lightning struck, in that village 10-year-old Kanya died. 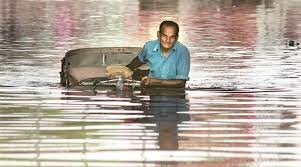 After flooding water in Kerala has now been given a red alert on the issue of Lepotospirosis epidemic. This waterborne disease has suffered 28 people in a month in the state. In the past week, nine deaths were reported and 300 suspected cases were reported. State Health Department has asked for more medicines from the center. The epidemic of mice in the flood waters of humans is torn apart. India has good rainfall in the month of August. 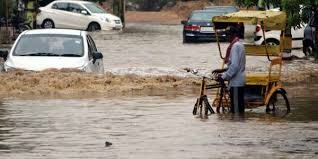 This is the best rain in the last five years in August, although in the month of August, the normal rains in the country have been reduced by 6.4%. This is a good rain in the month of August 2014. Translation too used is google translation.